¥1,500 + ¥700 (food menu) or ¥500 (drink menu). Additional orders are allowed and will be charged accordingly. Puyopuyo!! Quest (ぷよぷよ! !クエスト) or PuyoQue (ぷよクエ) is a Japanese mobile RPG game by Sega and is available on iOS, Android, and Kindle Fire. This café was previously held for a limited time in 2014 and again in 2015. This collaboration will be held with Sweets Paradise (スイーツパラダイス). Sweets Paradise is an all-you-can-eat sweets buffet chain with many locations across Japan. When visiting a sweets paradise collaboration location you will need to pay for the standard buffet fee which allows you to eat from their buffet which consists of cakes, soups, salad, & more for a one time fee of ¥1,500. To order from the collaboration menu is an additional ¥700 for food items and ¥500 for drink items. Additional collaboration orders are allowed. Puyopuyo!! Quest Café will be held for a limited time in 4 cities this year. Tokyo, Osaka, Nagoya, and Fukuoka between the dates of 11/5/18 - 1/15/19. Each location may have a different start/end dates so please check the duration of the café before visiting your nearest location. There was a special application for users to submit their menu ideas for this collaboration café and winning suggestions will be brought to life by the staff of Sweets Paradise. Congratulations to the winning entries! It is possible to call in a reservation or apply online however generally a reservation is not needed to visit a Sweets Paradise location or collaboration. Order benefits and exclusive café goods will be available at this café. 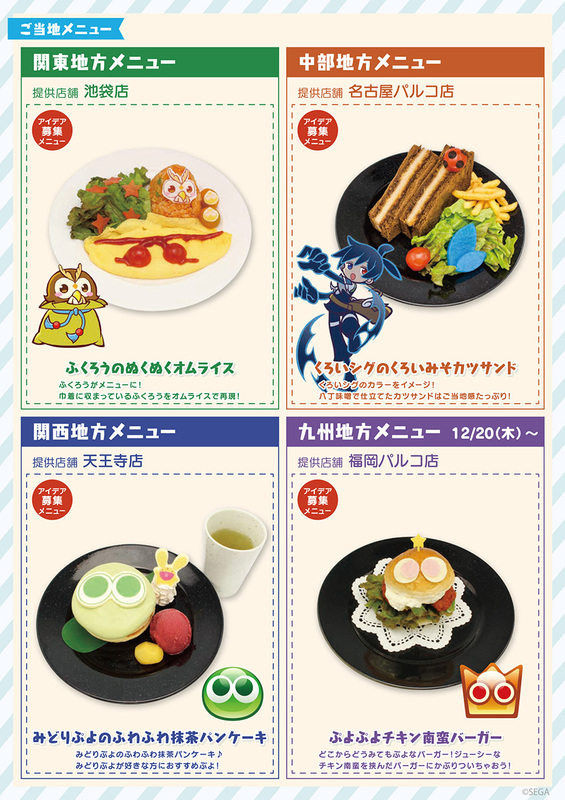 Each shop will also have a special region specific menu item that you can only purchase in that shop! A special night menu will also be available after 17:00 (or 5:00pm). This menu will contain alcohol so if you can not present your valid ID to confirm age, you will not be served. Collaboration drink menu. Normal menu is in outlined blue and the adult (after 17:00) menu is outlined in purple.